A comedian who claimed Twitter failed to reply to his requests to review hateful tweets has a strong message for the company. 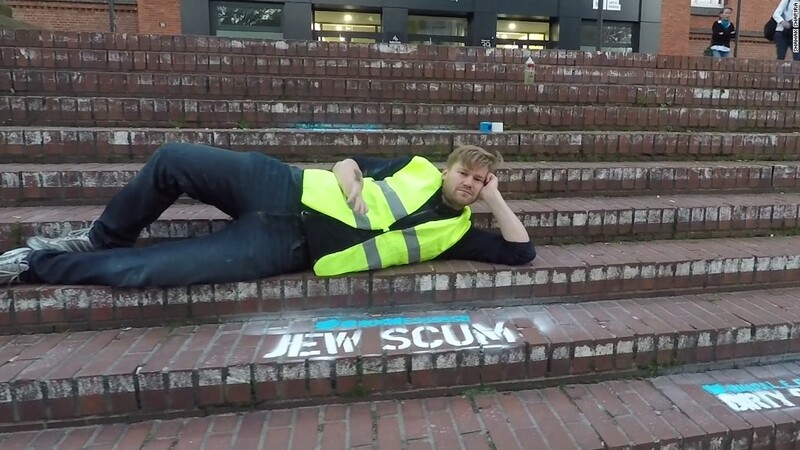 German-Israeli comedian Shahak Shapira spray painted what was said in the tweets onto the sidewalks outside the social network's offices in Germany. Shapira told CNN Tech that over the past six months he's reported hundreds of vitriolic comments sent to him on platforms like Facebook (FB) and Twitter (TWTR). Although Facebook typically responded within one to three days and removed the majority of the comments, Shapira said Twitter has only responded to nine of 300 reports. Out of frustration, the Berlin-based personality made large stencils of the unremoved messages -- some were racist, homophobic, Islamophobic or anti-Semitic. He then used a washable spray chalk to put them on the sidewalks in front of Twitter's Hamburg office. "Now, Twitter has to look at the messages they ignore so much," Shapira said. "The statements I reported weren't just plain insults or jokes, but absolutely serious threats of violence." One message was directed right at Twitter: "Hey Twitter! Deal with this...," he sprayed. Although the messages were sprayed overnight, they had been washed off by late morning. Twitter doesn't comment on individual accounts, but a spokesman said it strictly enforces rules where appropriate and allow users to mute or block accounts themselves. According to the June 2017 European Commission's review of Illegal Hate Speech online, Twitter has sped up dealing with notifications, reviewing 39% of them in less than 24 hours. This is up from 23.5% in December. The 24-hour-review percentage still lags behind Facebook, which reviewed 58%, and YouTube, which took action 43% of the time. Shapira said he's not sure know if he'll take further action but emphasized how the controversial hate speech law going into effect in Germany in October gives him hope. Social media companies like Twitter, Facebook and other social media companies will be fined as much as €50 million ($59 million) if they fail to remove hate speech within 24 hours.